Because, he saw them standing there. This page was designed to be viewed with a browser that supports Cascading Style Sheets [CSS] and if you are using earlier versions [pre- ver.5.0] of Internet Explorer or Netscape Navigator,you are missing out on a pleasant viewing experience. It is best that you upgrade your browser soon as most of the sites will increasingly make use of CSS. Damu noted a strange fact when he went around Bangalore. There were children at work everywhere and a majority of them were from his reasonably prosperous, educated home district of Udupi. Famous for its cuisine and entrepreneurs, children were encouraged to fan out and work in 'Udupi Hotels' that dot India. Damu realised his work was in Udupi district, which he had left looking for a career. He went back in 1989. Being the temple priest's son gave him credibility. The man who was organising factory workers, began to organise children. He reached out to working children planning to leave for the city. Most were slaving away as cafe labourers, cleaning and washing. He got a small group together and they called themselves the Bhima Sangha, after Bhim, one of the legendary Pandava brothers. Why Bhim? Children spoke with great sensitivity: "Bhim was the most selfless of the brothers and was always taken for granted. He willingly laboured for the family despite neglect and ridicule." They also chose the elephant as their symbol--for strength. The idea was to give children choices in vocations, that would lead them to self-supporting careers. Damu says, "Poverty is not just economic as many believe. The worst form of it is the poverty of information that children are subject to." Damu began to create a series of courses that would lead to self-employment: carpentry, masonry, basketry, horticulture, mechanical and electrical trade work, welding, driving and many others. 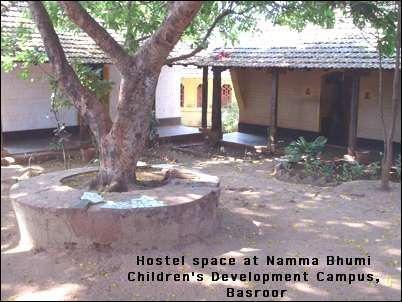 They are housed in a residential campus in Basroor --called Namma Bhumi or Our Land-- for the period of their training. While there, they are also humanised and empowered with arts, theatre work, music and debating skills. Nandana goes about raising funds and raising awareness leaving Damu to work closely with children. In 1990, CWC declared April 30th as the Child Labour Day. Thus the concept of a day in an year dedicated to issues of working children originated in India. Why April 30? Because the child worker must be cared for ahead of the adult one, who has the May Day. It was to be another 12 years before the UN's International Labour Organisation nominated June 12th as the World Day Against Child Labour.